Eric Finn President Matt Landsberg stands surrounded by players from the Redskins and Capitals -- all decked out in the tailor's custom bespoke suits -- moments before they took to the runway for this year's 'Walk This Way' presentation. 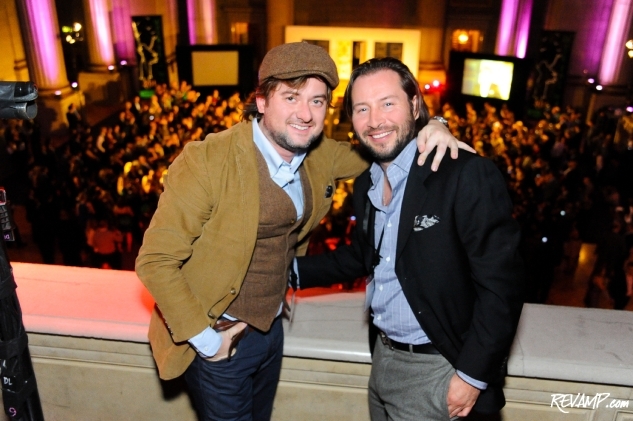 Be sure to check out all 121 of our photographs from this event HERE! 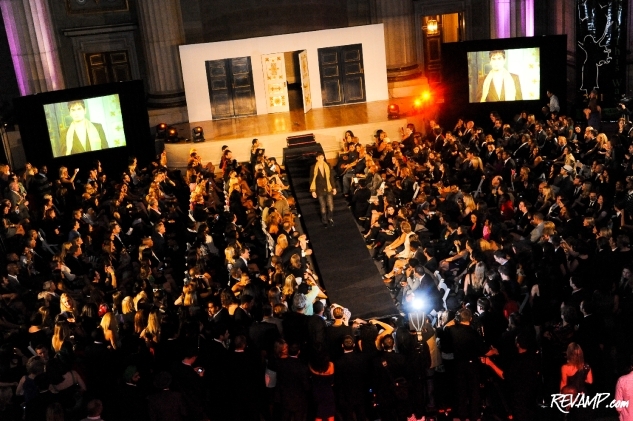 NORTHWEST -- With a sea of seated VIPs, a blinding barrage of flashbulbs, a thumping soundtrack, and, naturally, wave upon wave of sartorial splendor, this year�s much-anticipated �Walk This Way� runway show embraced its new home at the Andrew W. Mellon Auditorium, with energy and panache. 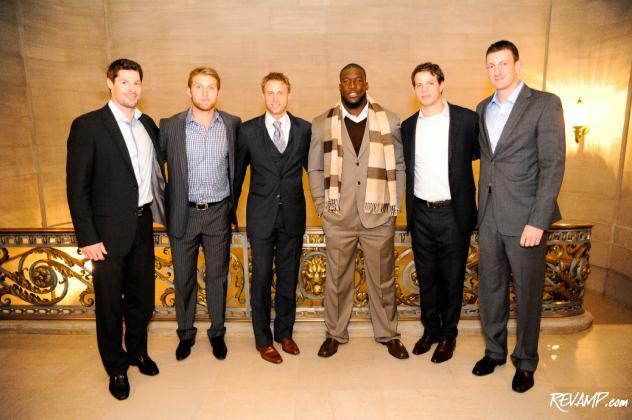 The third installment of Becky�s Fund�s signature annual fundraiser, last night�s fashionable fete saw a dozen or so athletes from the Washington Redskins, Washigton Capitals, and D.C. United take to the runway, in support of the domestic violence prevention charity. 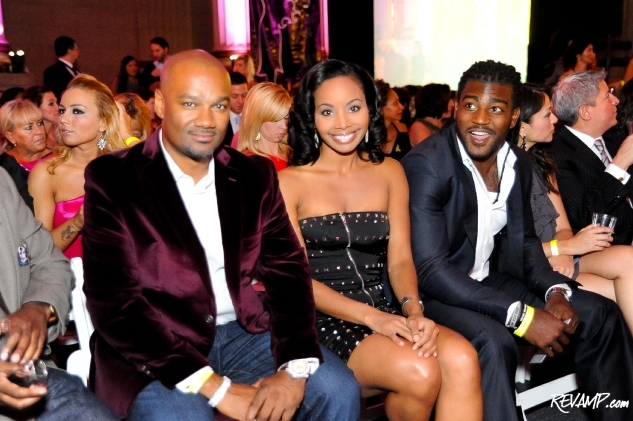 The evening�s celebrity models counted Brian Orakpo, Anthony Armstrong, DeAngelo Hall, John Carlson, Karl Alzner, Nick Backstrom, and Ben Olsen among the participants, with many of their respective teammates spotted showing their support in the audience, including the Redskins� Tim Hightower and former New York Jets linebacker Marvin Jones. 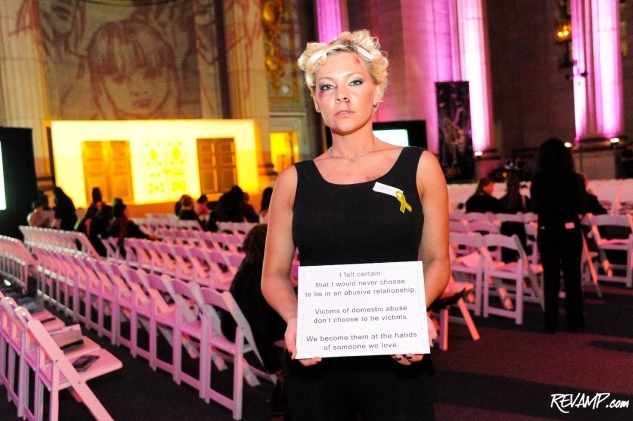 Unlike the typical runway show, this year�s �Walk This Way� event highlighted three compelling stories of survival describing the cycles of domestic violence, in a unique theatrical presentation that incorporated three eras of design, as interpreted by venerable D.C. design house Eric Finn Custom Clothiers (a favorite among many of the city�s star athletes) and renown women's designer (having dressed everyone from First Lady Michelle Obama to Nicole Kidman), Maggie Norris Couture. While not on-stage, the evening�s co-hosts, Comcast Sportsnet and Fox5 Morning News respective anchors Julie Donaldson and Steve Chenevey, could be found mingling among the guests for most of the night, with everyone enjoying passed bites or cocktails from a series of open bars. Sandro Keresa and Tati Ana�s Art Soiree collective added a further injection of artistry to the event, with a special video installation showcasing local artists projected above the main stage and a series of models adorned in body art walking about. Founded in November 2006 by Becky Lee, Becky's Fund is a D.C.-based non-profit focused on the prevention of domestic violence. Becky used the prize money she won as a contestant on the acclaimed CBS prime-time television show Survivor: Cook Islands to start the organization.